Just for Fun required 1 book each month and I completed that with 12 books. All of the stories in this collection refer to the Stan Lee/Jack Kirby area, the earliest history of FF. (By the way: Marvel, only 4 issues in a collection? Man, that’s stingy!) They’re also setting up further stories in the future. 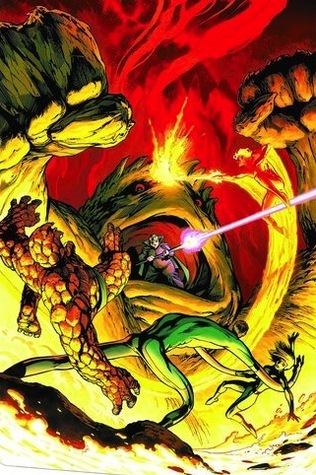 In the first issue, the Mole Man comes seeking for help from the FF. The High Evolutionary has a city underground, in the Mole Man’s kingdom. However, the Ascension Engine, which power’s the city, malfunctioned and started to warp the minds of everyone in the city. The High Evolutionary and his people fled, leaving the engine on. Now the city is rising to the surface and the Mole Man doesn’t want a war with the humans, so he asked for help. In the next issue, the FF go to the Antarctica and do some underwater exploration. Next up is the Blue Area of the Moon. The Inhuman city of Attilan has left. However, the Inhumans have formed an alliance with some other races and it all bodes trouble for Earth and the FF, particularly. The last issue focuses on Johnny who has brought a date back to the Baxter Building. Unfortunately for him, the lady is far more interested in the Negative Zone portal… especially because she has some bugs inside her skin who are eager to go to the zone. These are all really short pieces but they don’t have slugfests, instead they have FF exploring which I always love. Eaglesham’s art is stunning, especially in the underwater issue. My only complaint is the covers: in the first one (which is also the collection’s cover) Susan is being rescued by Reed and in the last one Susan is missing. Really? Haven’t we established already that Susan isn’t a damsel in distress and that she’s an integral part of the team? But inside she’s just as valuable member as the others and in the undewater issue she gets a very interesting new job. Happy holidays to everyone who are celebrating! Hickman starts his writing gig with clearing up some leftover stuff from the previous writers. First off is a three issue story about Reed. The FF defeats the Wizard (again) and it seems that he has cloned himself and has a child clone around. Franklin is worried about what happens to the child clone, Bentley, and that makes Reed thoughtful. Reed returns to his “Fix everything” solution. He has rebuilt the Bridge which leads to another dimension where a whole lot of Reeds are trying to fix the whole omniverse. He has a hard choice to make. We get to see Reed’s dad, too, and that’s pretty rare. I don’t remember seeing him anywhere else but in John Byrne’s run. Anyway, Reed sees both the good and the necessary evil which the Reeds of other dimensions are doing and it’s both great and creepy. We get to see a lot of different Reeds from alternate dimensions and some other pretty cool science fiction stuff. Of course, we know how he will choose in the end, but it’s a great way to put an end to that Bridge stuff. Next is a fun one-shot issue centering on Ben and Johnny. They’re going on a vacation on Nu-Earth, the artificial paradise planet designed by a bunch of geniuses. Except that things go wrong right at the start. For one thing, Franklin and Valeria hitchhike a ride with them. This turns out to a very good idea indeed because time runs different in Nu-Earth and things have changed radically. The last issue is Franklin’s birthday with a guest appearance by Spider-Man, Franklin’s favorite hero. We get to see Power Pack members and there’s even a time-travel story to wrap the issue up. The traveler brings grave warning… to Valeria Richards. Hickman’s run centers on FF as a family again, rather than superstars. They also do more exploring than basic superhero slugfests, which I really like. The last issue also builds a foundation for future stories when Reed invites the clone Bentley, Leech, and Artie to stay with them and offers a job to Alex Power. The art isn’t as slick as Hitch or Davis but it feels to me reminiscent of Kirby’s style, especially with all the FF in short sleeves. I’m looking forward to rereading Hickman’s run. The collection starts with four smaller stories. The first is the funeral of the Invisible Woman, an epilog to the biggest story in the previous collection. Everyone gathers to honor the death of another Susan Richards and later Ben proposes to his girlfriend Debbie. Next is another one-shot “Mr. and Mrs. Thing” where people congratulate Ben and Debbie. Also, Debbie get a taste of what her life would be like married to a superhero. Then we get a two-parter Christmas story set in Scotland. Reed brings his family and Ben and Debbie to Reed’s cousin to celebrate a more down to earth Christmas. At first, the town feels peaceful but that doesn’t last. 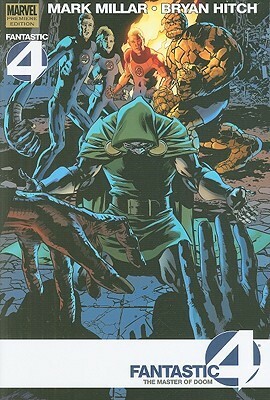 Next is four-part Master of Doom storyline which has been building during the previous issues. Doom has a master who has taught him everything he knows about evil and destruction. That master has taken a new apprentice and together they’ve destroyed countless alternate Earths and their Fantastic Fours. And now they’re coming to our Earth. The final issue is the wedding of Ben and Debbie… sort of. We’ve had hints that something terrible will happen to her. I must admit that while I wasn’t surprised that Ben didn’t get married, I was surprised by the reason. This was an entertaining collection but nothing new for the FF. I didn’t really buy the whole Doom’s master thing. The plot has plenty of action but a few holes as well and does seem out of character for Doom. Doom as an apprentice?! The ending was appropriate, though. We also get a brief glimpse into an alternate future which would have been very interesting if it hadn’t been wildly out of character for everyone involved. Despite some great ideas Millar’s run was a bit “meh” to me in the end. I recommend John Byrne’s, Jonathan Hickman’s, and Matt Fraction’s runs for those interested in FF. A book of six tales nested within each other. I’ve seen the movie which of course influenced my reading. I also liked the movie quite a lot. But watching the movie first “spoiled” the book; I already knew the big idea behind the book so the book couldn’t wow me. 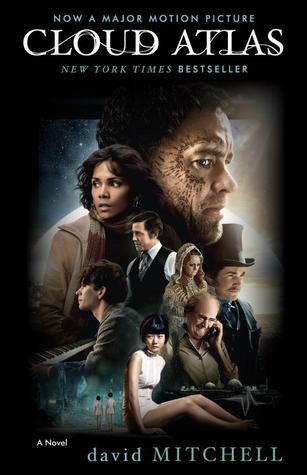 Cloud Atlas has six novellas each set in different time period and with different characters. They’re also written in different style. In each story, the central character of the story reads the previous story, except in the first one, obviously. It is a kaleidoscope of lives which are connected through the years in a tapestry of human life. The first one is Adam Ewing’s dairy about his sea voyage around 1800s. It’s written in first person and emulates the style of writing at that time. Adam is a religious man and deeply dislikes the rowdy ship captain and his crew. He’s also a sick but managed to find a doctor to travel with him. The second story is a number of letters written by a broke English composer Robert Frobisher in 1931 to his friend (and lover) Sixsmith. He manages to secure himself a place as the assistant to a former great composer Vyayan Ayrs who is a very sick man and very disagreeable, too. Robert is attracted to the composer’s younger wife in addition to the small amount of money Ayrs pays him. The third is called Half-Lives the first Louisa Reye mystery. It’s written in multiple POVs and present tense, mimicking noir style. Louisa is a journalist in the 1970s US. She has integrity and wants to prove herself but she working in a less than reputable paper. However, she stumbles into a very big secret and doggedly pursues the truth. The fourth is “The Ghastly Ordeal of Timothy Cavendish” and is written by an elderly vanity publisher. It’s most humorous piece in the book. Timothy stumbles upon a book which sells millions… and puts him into deep trouble. The fifth is “An Orison of Sonmi – 451” and is set in the future where corporations rule the world, or at least the small part of the world we see. Sonmi is a replicant, a person designed and grown for the sole purpose of being a waiter. But one day she has a chance to see the world outside her diner. The final story is set in apparently far future when civilization as we know it has collapsed. The first-person narrator uses somewhat different English than the modern day variant and it’s somewhat difficult to read. The narrator is a goat herder in an Iron Age village but sometimes the village is visited by people who have far more advanced technology. Except for the last story, the others are interrupted in the middle by the next story and after the last story is done, the others continue, the first story’s final part last. I really like this type of structure and I liked the links between the stories, too. The final story was quite difficult to read and by that time I was impatient to find out how the other stories end. My favorite was Sonmi’s terrible tale. However, the links weren’t enough for me to bring this to a coherent whole: they feel separate stories to me. Cavendish’s tale has some amusing pokes at the literary establishment and reviewers, perhaps Mitchell is anticipating what some people will say about his work. He also puts down the British railways. All the characters are flawed people and convincing as humans. They depict people at their worst, being cruel to each other, but in the end, hope glimmers in every human who ends up behaving humanely to each other, especially if their society frowns on it, or even forbids it. I love Hitch’s art and he’s in top form here, so the art is fantastic! Except for some really weird faces on Alyssa and some of the other women who apparently talk with their tongues out. Millar’s writing promises big things to come and he does start with a bang: the FF are returning from a time travel journey. Then Reed’s old girlfriend Alyssa returns and she needs Reed to consult something. It turns out that Alyssa’s new husband is also a genius scientist and he’s built another Earth because according to their calculation this Earth is going to be uninhabitable in less than ten years. Not from a supervillain attacks but from environmental collapse. And rather than trying to stop it, it’s easier to duplicate the Earth in a parallel dimension. It’s called “Nu-Earth”. Well, not everything will be duplicated. Weapons won’t be and the geniuses also built a huge robot to keep the peace. Of course, the robot (called Cap) gets loose and tries to kill everyone. Meanwhile, Johnny rans across a supervillain who’s robbing a diamond shipment. Instead of arresting her, he sleeps with her. He’s also building a band and his house is rigged into a reality show. Ben has a new (ordinary teacher) girlfriend and Susan is forming a charity. The second story arch is “The Death of the Invisible Woman” and it brings back Dr. Doom and introduces a new villain group, the New Defenders. In fact, the New Defenders are hunting Doom who needs help from Reed. But Reed and Sue are away so the New Defenders wreck the Building fighting Ben and in the end take the rather worn-out Doom with them. Reed is determined to find him and we’re shown that the group is headed by a very familiar green giant. Oh and the Richards’ have a new and mysterious nanny. She’s a sweet old lady who is really good with the kids. But soon we find out that she knows more about Valeria than her parents. 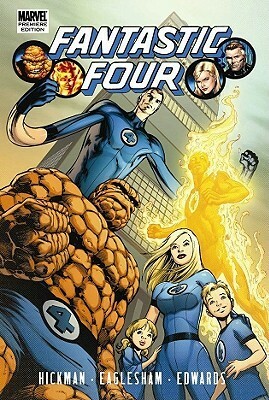 Millar takes the FF back to their roots, as Marvel’s first family. Unfortunately, he also resets everything the group’s learned in the (recent) years. In a way this is the perfect time for new readers to pick up the comic because no background information is needed. Johnny is, once again, the irresponsible teenager, Reed the genius with his head in calculations, Ben a jock with a heart of gold, and Susan is the responsible one. Unfortunately, I found these FF more obnoxious than heroic. Johnny is especially terrible: he’s arrogant and thoughtless. Susan is jealous about Reed and women sigh over Reed and Ben. In essence, they’re movie stars. 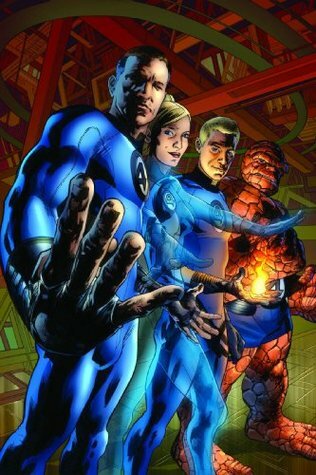 Like in many FF stories before Millar’s, Reed’s story is the only one which really matters. To me this was a frustrating read because Millar has a lot of interesting ideas (Galactus Engine!) and he works with troupes I really like. I also enjoyed the new villains and even more when I found out who they really were. But I was less happy with the representation of the characters and where the stories went. The collection has entertaining stories but not as great as they could have been.